As the dust settles in Durban and the circus moves on, we reflect on a few of the bigger moments of AIDS 2016. Below are some of the highlights we think may turn out to be significant. For a few hours on Monday 18 July United Nations Secretary-General Ban Ki-Moon was in Durban. He was there to talk about HIV, but also to talk about access to medicines. Late in 2015 he had appointed a High Level Panel (HLP) to consider problems with access to medicines and the lack of innovation in important disease areas. That he chose to travel to Durban on the eve of receiving the HLP’s report on these issues is significant. On Monday morning Anele Yawa, General Secretary of the Treatment Action Campaign, presented a memorandum to Ban Ki-Moon urging him to take steps to “never again let people die because they cannot access medicines”. If part of Ban Ki-Moon’s mission in Durban was to take the temperature ahead of receiving the HLP report, he would have found it to be scorching hot. Whether that has any influence on what happens with the HLP report and to what extent the report and its recommendations lives or dies within the United Nations remains to be seen. One of the big stories of AIDS 2016 is the shift away from “end of AIDS” rhetoric from UNAIDS. In a move welcomed by activists, UNAIDS Executive Director Michel Sidibe said that we are not currently heading toward an end to AIDS and TB. Along with a number of other speakers at the conference he highlighted the reduced funding available for the AIDS response and the fact that the rate of new HIV infections is not coming down. 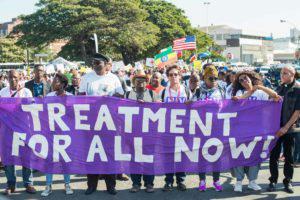 But, whether the change of course from UNAIDS together with the show of power on the streets of Durban will be enough to push the global AIDS response back on track is unclear. There was great hope that the TasP (Treatment as Prevention) trial would show that providing more people with treatment earlier will reduce the rate of new infections in a community. Unfortunately, this important trial failed to show a significant reduction in new infections in communities with early treatment. The problem appears to be to get enough people tested and then to get those people to initiate treatment. In better news, new findings from the Partners trial confirmed that people who are stable on treatment with undetectable viral loads do not transmit HIV to their sexual partners. The sobering message from TasP then is that we’ll need to do a lot more to actually get people tested and on treatment, but Partners confirms that getting it right will have a huge impact on new infections. In another notable statement from UNAIDS, Sidibe said that the world needs to train a million more community healthcare workers (CHWs). He said that South Africa should have 200 000. This is significant since the line from the Minister of Health in South Africa has until now been that 40 000 CHWs are enough for South Africa. It is now up to activists around the world to use Sidibe’s comments to push for the training and employment of many more CHWs. Much lofty rhetoric at this year’s conference focused on the extremely high infection rates in young women and girls. Much of the rhetoric was of course not from young people. When young people did speak out – interrupting South African Minister of Health Dr Aaron Motsoaledi – it was to say they want access to condoms and sanitary towels in schools. On Tuesday morning Justice Edwin Cameron delivered the prestigious Jonathan Mann lecture. Apart from being humorous and moving, the speech had a remarkable moral force and clarity. One of the disappointments of AIDS 2016 was that more people did not name and shame countries for discriminatory laws that undermine both the rights of human beings and the AIDS response. On the morning of 21 July activists marched from the conference to the Indian Consulate in Durban. The activists were protesting the Indian government’s crackdown on civil society groups such as the Lawyers Collective and India’s yielding to pressure from the United States on intellectual property. The activists say that India’s status as the pharmacy of the developing world is under threat and with it the global supply of quality generic AIDS medicines. The memorandum was endorsed by current, future and past leaders of the International AIDS Society. One of the key themes of the 2016 conference was that we need to change the way healthcare systems deliver services to people living with HIV if we want to provide all people living with HIV with treatment. The evidence is in. It is now up to healthcare systems to start implementing more task-shifting, adherence clubs, and care models requiring fewer clinic visits. There is also new evidence suggesting that offering people treatment on the same day as testing HIV positive leads to more people starting treatment. Not surprisingly, a community healthcare worker-based programme helped to improve TB detection rates in a study in Malawi. While it is hard to change the inertia of old ways of delivering care, we now seem to have reached a critical mass of evidence on what we need to do to make healthcare systems much more effective and efficient. Integrating these new ways of doing things must be a top priority for health departments in high HIV and TB burden countries. stand at the conference with hundreds of bras. 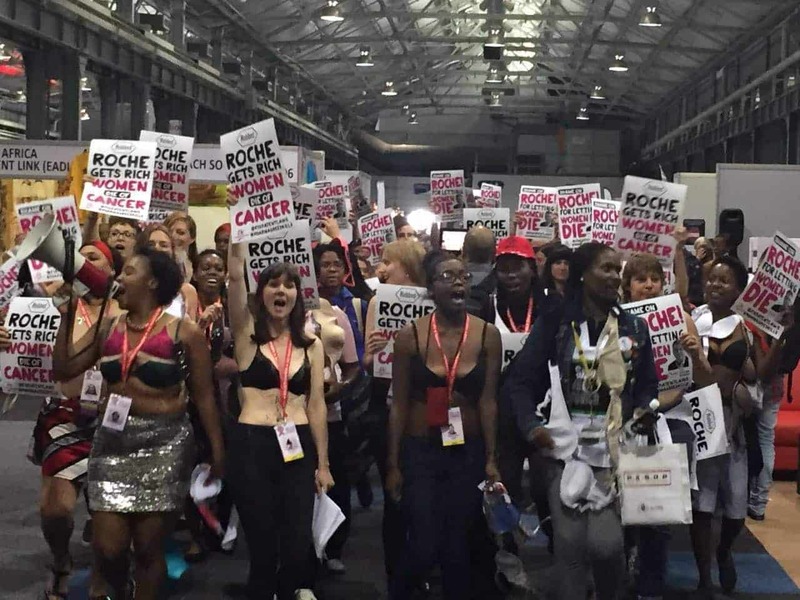 The activists were protesting the high prices that Roche is charging for the breast cancer drug trastuzumab in South Africa and other countries. In South Africa a course of the drug costs a half a million Rand. One of the protestors was a breast cancer patient from South Africa who has not been able to access trastuzumab. Her cancer has recently spread – something taking trastuzumab could potentially have prevented.